It’s not new news that while Microsoft is starting to make waves with Windows Phone, particularly in Europe with Nokia, overall, it is still severely lagging behind its competition – Android and iOS. The Redmond-based giant has started to launch initiatives to advertise the strength of Windows Phone, such as the Smoked by Windows Phone campaign, but even the Director of Windows Phone, Aaron Woodman, thinks they need to do more. So what kind of fight is Microsoft going to pick? It isn’t exactly clear, but Woodman did say they would be expanding the Smoked by Windows Phone campaign over the next six months. Based on that, we would assume the challenges, where participants compete against a Windows Phone in a variety of tasks with their handset of choice, will become more aggressive and target certain competitors. They should hire Justin Bieber to advertise their phones. They'll turn into something like Apple. Either you love 'em or you hate 'em. I agree, this is the best way for them to win bigger market share! How about just doing some real marketing, a little advertising, a commercial or two? I don't get why cell phone companies don't get how important it is to show what your product can do. They can win over a few people who don't know any better with the "Smoked by Windows" BS, but that's not going to win over millions. And they need to spice up the UI too, at least for some of us. Those tiles are just boring. WP7 is a very smooth os and has potencial but those tiles those dang tiles kill it for me! i am with you i tried a windows phone, and actually loved the fluidity and smoothness of it. i found it to be the easiest to use out of all mobile os's. but, what did it for me was the faggity metro font. it looks graceful at first glance, but then, after awhile became really annoying .exp with the emails all translated in metrosexual font! so alas, back to good old trusty android! Agreed the very box tiles ui is a killer for most people,its very dated and quite off putting and most customers who see it demonstrated instore instantly ask us what better alternatives have we to offer them,most have seen stunning beach lapping waves live wallpaper backgrounds and menu ui on their friends android phones for example while windows is like Amstrad 464. The sales are been poor as a result. The platform itself is neither here nor there,i don't hate it per say just i hate having the backlog of unsold windows phone stock never leaving our store. I have an Evo and a HD7. WP7 is nice for a while as a secondary phone. But it severely lacks in its ability to be a primary smartphone OS. It is lacking a lot of useful free apps, as well as functionality that Android has. I'm going to be switching back to having two Android phones pretty soon. 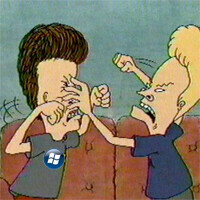 I like WP7 but the 'smoked by windows phone campaign' is a fail. Sure it can show how fast and usable windows phone is, but this will also make other OS users have bad feeling. In hong kong this campaign is poorly advertised. Also the host tell those droid and iphone users who lost to throw away their 'sluggish' phones. I dont think humiliating people is a proper way to advertise.